No, they are not terrorists. Some insects in the animal kingdom have been known to self-destruct, as a form of altruism to save their colonies or brethren, when harassed or pursued by a predator. Below are some examples of such self-exploding insects. This species of ant, sometimes known as Exploding Ants or Kamikaze Ants, is found in South-east Asia, more commonly in Malaysia. The ants contain the toxic substance in their heads and in 2 large glands on the sides of their bodies, called mandibular glands, which are filled with poison. Under threat, they will explode their head to spew the poison or rupture their bodies by squeezing their abdomen. This causes the glands to break and spray the sticky poison in all directions to engulf the predators, immobilising them. This is a self-defensive mechanism called autothysis, when the organism ruptures an organ that explodes its body and kills itself in the process (Maschwitz and Maschwitz, 1974). Another insect that uses this method is the Globitermes sulphureus. This species of termite is also found in South-east Asia, mostly in Vietnam and Malaysia. 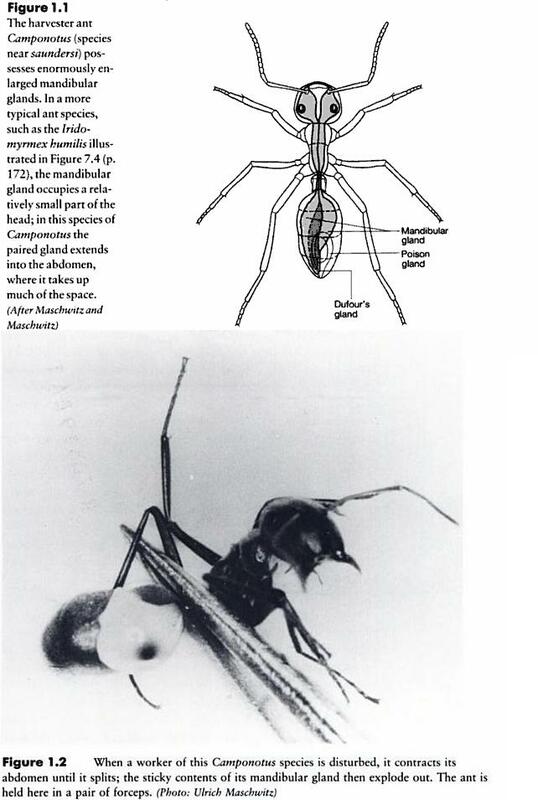 The picture above shows a soldier termite with rather obvious mandibles or pincer-like hooks. Under threat or when faced by a predator, the soldier termites first captures the predator by its mandibles. It then squeezes its abdomen and this ruptures the glands that contain a stick yellow substance that hardens after exposure to the air. The toxic substance, when explodes out of the termite’s body, covers not just the victim but the termite as well. And this is how the termites die together with their victims. The substance also contains a pheromone that alerts other soldier termites to the danger. A pretty nifty defensive mechanism! This is a pea aphid. The pea aphid is an agricultural pest and natural predators like lady bugs are often introduced to control its population. According to Thomas Joiner in an interview with Discovery News, these insects will explode themselves,and in the process saving their brethren by scaring off the predator. The explosion may even kill the predator. 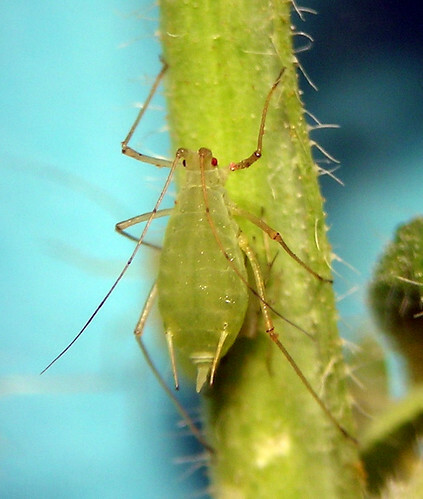 The pea aphid has also been known to explode after being consumed by its predator. However, not many details are known about the actual physical mechanism that causes the explosion. But this creature is no stranger to suicide. Pea aphids are also parasitic hosts for wasps. Wasps lay eggs aphids and and the young wasps will feed on its host before killing it when it emerges. This parasitic behaviour poses a danger for a population of pea aphids, and thus in an act of self-sacrifice, the infected aphid will throw itself to the ground to be consumed by its predators (Joiner & Van Orden, 2008). So you see, suicide bombers and suicide, is not just a human thing. I happened to stumble upon a video on Youtube recently about the “Top 10 Animal Power Moves”. Zooming straight to the top of the list is the Carpenter Ants or Camponotus saundersi. So what power moves do they possess? The Carpenter Ants, found in Malaysia and Brunei, are given the nickname “exploding ants” as they will do just that when confronted with danger. 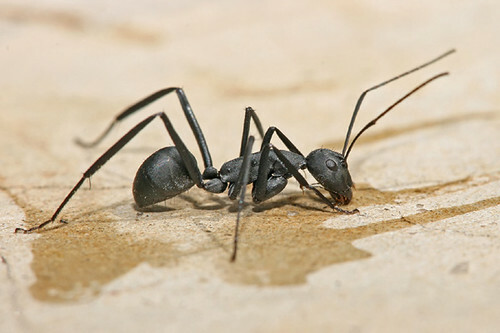 Not all of the Carpenter Ants have the ability to get into self-destruct mode. It is the worker ants, charged with the duty to defend the colony at all costs, that would use this defence mechanism as the ultimate sacrifice to protect its colony. These worker ants have greatly enlarged mandibular glands compared to other ants and these glands run the full length of its body. When the ants are under duress, they will contract their abdomens muscles vigorously, causing the glands to implode and spray gluey toxic in all directions and thus immobilizing its predators even if it means at the expense of its own life. They will squirt toxic mainly from its end, from its mouth and through its ruptured exoskeleton. This process of internal rupturing or autothysis is surprisingly not rare in the animal kingdom. It is popularized by the Carpenter Ants but is also noted in other species like termites and toads. Most of the time this happened the ants are either confronted with grave danger or fighting a losing battle against predators that are physically bigger. For its predators, the costs of attacking the Carpenter Ants would then outweigh the benefits and make them think twice about pursuing its attack. Talking about ending it with a bang literally. In this case it is a boom. James Ridley,Blackwell Science,2003. “Questions about Animal Behaviour.” Animal Behaviour 2nd Edition, pg 1-4. Ants are hardworking and have been found to sacrifice for their colony. For example, worker ants sacrifice their reproductive chances for the colony queen to ensure that the colony survives and gets expanded. However, such acts did not involved suicidal intentions or sacrificial acts without an immediate threat to the colony. But recently, scientists have found an ant that sacrifices its life even without an immediate threat present and suicidal intentions were discovered in such ants in attempt to protect the colony. The Brazilian ant, Forelius pusillus, takes “self sacrifice to a whole new level”, by sacrificing their lives to protect the colony. Upon sunset, the Brazilian ants cover their entrance with sand and some of these Brazilian ants would stay outside to complete the job making sure their colony is safe. Due to the covered entrance after the job is completed, these ants cannot reenter the nest and dies before the next morning. It was also mentioned that the ants were on a suicidal mission and deliberately stayed outside to help hid the nest for the night. It still remains as a puzzle today what are these ants guarding against in the night, however, it was speculated that they might be protecting themselves from large roaming colonies of army ants. Closing the door behind them - The brazillian ants sealing off the nest entrance to protect the colony from dangers for the night. Although altruism in ants are not new in science today, it really impresses me in how much these ants are willing to sacrifice for their colony. Imagine walking in the impossibly dense and diverse forest of Peruvian Amazon and chancing upon an eerie, unusual sight of an odd patch of clearing where only 1 plant species lives, the Duroia hirsuta tree. It is what the locals call the Devil’s Garden, where the trees are cared for by the devil itself. 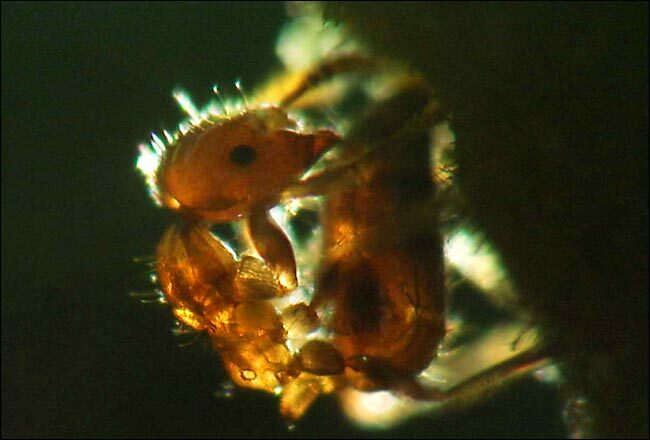 However, recent research has suggests a much unlikely culprit – Myrmelachista schumanni ants. Previous studies have fasely identified that devil’s gardens result from allelopathy, which is the local inhibition of plant growth by another plant, in this case D. hirsuta. Myrmelachista schumanni, commonly known as lemon ants due to their taste, injects Formic acid to poison all other plant species except its host plant. Although formic acid is common amongst ants as a defense against insect or animal attacks, it is the first time it has been known to be use as herbicides. Researches call this niche construction, as lemon ants resides in the hollow stems of the host plant, they gain more nests by ensuring the growth of such trees by eliminating competition. Animals seemingly never cease to amaze, the manipulation of the environment by the lemon ants is comparable to Man’s ability itself. One of the Devil’s Garden is estimated to be around 800 years old, these relatively small lemon ants’ ability is certainly astounding! Megan E. Frederickson, Michael J. Greene & Deborah M. Gordon, 2005. ‘Devil’s garden bedevilled by ants’. Nature, 437:495-496. David P.Edwards, Megan E. Frederickson, Glenn H. Shepard and Douglas W. Yu, 2009. “A Plant Needs Ants like a Dog Needs Fleas: Myrmelachista schumanni Ants Gall Many Trees to Create Housing”. The American Naturalist, 174(5):734-740. Houston we’ve got a problem!!!! It appears that the ants share our love for technology. The Crazy Rasberry Ant otherwise known as Paratrechina species near pubens is fast replacing fire ants as the main concern of pest infestation across the united states. 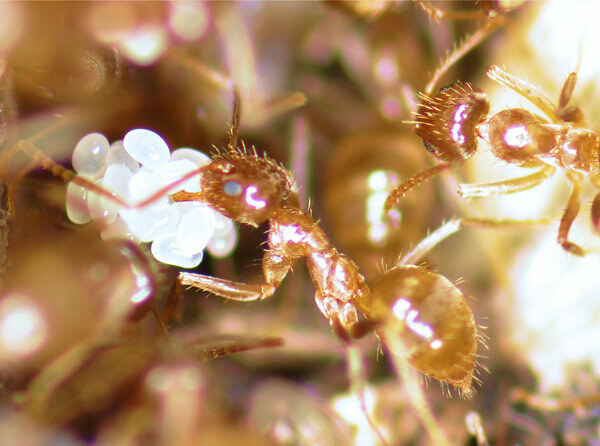 These little terrors similar to their cousins – the Fireants or ants from the genus Solenopsis have a preference for electronic devices, like electrical boxes and computers over sweet stuffs. This has proven to be a major problem especially when the Crazy Rasberry Ant decided to make Texas where NASA is located as their home. The Crazy Rasberry Ant, according to observation seems to enjoy feeding or biting on electronics. In heavily infested areas they often appear in clusters hiding inside power sockets and many other electronic appliances, causing overheating and short circuits. Tom Rasberry who first discovered the species highlighted its staggering resilient to pesticide and the species’s ability to repopulate itself “I sprayed some pesticide just to knock them down, But the next year I went from seeing a couple thousand to millions of them.” This seems to be contributing to their rapid dispersion across Texas. Preying on the fire ants and out competing them through a faster reproduction cycle. The Crazy Rasberry ants is slowly marching towards NASA’s headquarter. Electric appliances reported to be damaged by them includes Computers, burglar alarm systems, gas and electricity meters, iPods, telephone exchanges and even pumps at a sewage facility. 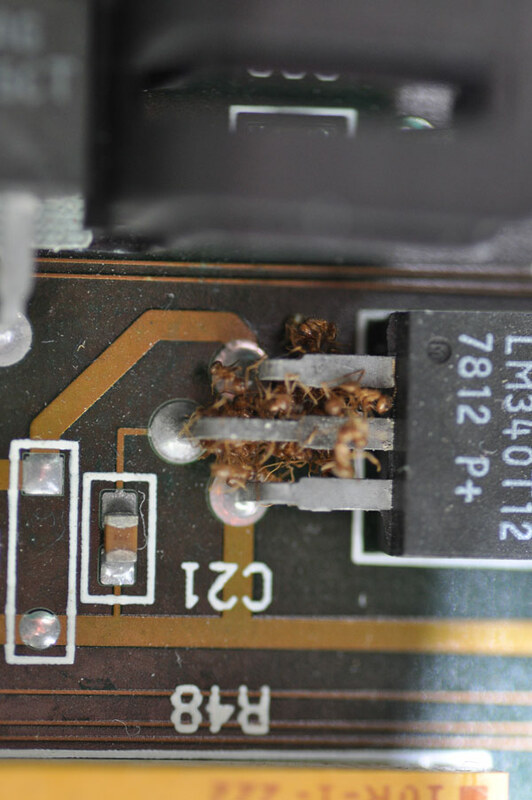 An infestation of these electronics hungry ants in NASA would prove to be extremely devastating. The cost of replacement for the billion dollar computers, the risk to national security and space expedition would be unimaginable. The threat is real and imminent yet scientist know little about this enemy who seemingly happen to appear from no where. Some entomologist suggest that ants simply take refuge in electrical appliances due to the shelter it provides against predator. Others claimed that all ants are attracted to electric wires. In an experiment conducted by Mackay, Majdi, Erving, Vinson and Messer (1992). The researchers tested 10 species of ant’s reaction to differences in electric field. They found out that electric appliances are damaged by ants which are attracted to the electric fields it produces. This further substantiate the danger that The Crazy Rasberry Ant pose on NASA. First discovered in 2002 by Tom Rasberry, the Crazy Rasberry Ants is distinguishable by its erratic movement dissimilar to other ants which moves in trail. Hence the “crazy” in its name. As of now, little is yet known about the Crazy Rasberry Ant. “Ants in Texas” International union for conservation of nature. URL: http://www.iucn.org/about/union/secretariat/offices/usa/about_usa/invasive/ants_in_port_houston/ (accessed on 3 APR 2010).